I guess I missed something… how is again that you can tell it is fake ? Other than the obvious rule of thumb Chinese people tell me (assume everything is fake in China). Beyond that — can you get REAL Sunkist in China ? Because I often wonder if some of the faking isn’t entirely in vain, if something is a brand Chinese DON’T know, then what the hell does it do except to give a brand which hasn’t yet entered Chinese market FREE widespread name recognition. It’s supposed to be “Valencia.” With a V.
I’m eating ‘Sunkisst’ oranges this year, which don’t seem to be pirated so much as attempting to borrow something intangible from the name – the box clearly states “P.R.C. Oranges”. Nope, you were already devouring yours during this orange’s photo shoot. I ate the one pictured. And yeah, it was pretty good. Florida says “Go, John! You tell ’em!” — even if Valencia oranges don’t come from here. So how do we get hold of inspector 3108? Are there no Plorida or Galifornia organges? Stumbled on your site while looking for pics of those chinese welder masks that all the women wear. Anyway, very interesting blogs you got here. I hope to make it out to Shanghai in August (I’m from LA). 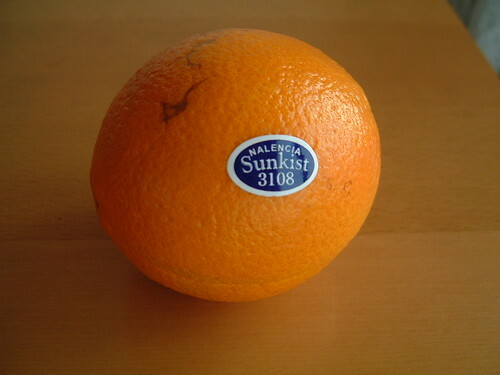 What I really want to know is, can we get a picture of a Nalencia orange that’s been spray-painted to look “fresher”? It’d be a piracy two-fer. But will it play on my DVD player? why do ppl priate even fruits? ppl are crazy about named brands ,such like gucci, LV and parada even thou they are counterfeited with the faked labels sticked on. most of ppl are proud of the bands and exorbitant prices (they could! )which indicate their wealth. they dont care about the quality or praticability as long as it’s a BRAND. i’m not an appraiser ,but i know there are lot of faked labels. peepin up! Not just the Chinese. You can ask Kiwi Chris (TaiChiMaster) about your beloved KIWI Fruits … you know, the hairy outside egg shape, the tart green insides, famously coupled in artificial varieties such as Strawberry Kiwi juices and candies. Anyways, Kiwi fruits, like the New Zealand Kiwi Bird, are famous worldwide. So famous, and mainstream consumed, that California has their own kiwi fruits grown in California. They sell in the stores as kiwi. But New Zealand invented that name, “Kiwi” and did all the footwork for marketing it to the global fruit consumers. So now, New Zealand, has their renamed their New Zealand grown Kiwi fruit to “Zespri” … so what this one example shows is that people pirate fruits, and putting a small sticker on a fruit is just taking whatever marketing that’s already been applied into action on a possibly inferior or even superior product. To hash it out further, think 2Pac and then replacing him with 50Cent – there was a 10,000,000 person market that needed to be filled. Notorious BIG could not fulfill that market and was ultimately murdered, too. So in comes the marketing genius of Aftermath Records led by Dr. Dre. The list goes on…. Oh yeah, check out the 8gb USB Flash Drives on ebay —- 8 GB on a tiny flash drive – they’re obviously fake and have SONY stamped onto them – and for that reason, people buy them, perhaps nievely believing that the decades and decades of Sony marketing and promotion will protect their investment. They’re not fakes, they’re genuine Nalencia oranges. I’m sure they have Nidalia onions too. Not to mention Nahquita bananas. I’m pretty sure that the “Kiwi fruit” was known as the Chinese gooseberry before the branding campaign took over. A success, that one was. As a Spanish blogger in China, I feel really angry!!!! I think I’m going to protest in front of Zhongnanhai. Valencia men, Valencia!!!!! Mother -Well, you must have a little. At least for the big names, like Coke, right? Friend – Uh, no? Really, there’s no counterfit foods at all. The government’s very strict on that sort of thing. A coke is a coke. Her and I had a bit of a head-shaking chuckle about it when she got home. Seeing this makes me realise where the mum was coming from, though. My take and concern on the fake foods are more than just the labels. US is by no means perfect, but at the least there are accountable agencies and legal mechanisms to ensure a minimum standards of safety and quality of the food products sold domestically in US. You do not necessarily have such rigorous efforts in other countries. Using the orange example here. WHAT did they use to cultivate the oranges? Where did they grow these oranges (anywhere near the river tributaries of the toxic industrial material contamination scandal in Northeast China, or other areas we don’t yet know about)? What kinds of pesticides did they use? Sweet or not, would you feed an orange or two laden with lead, mercury, DDT, or dioxin to your kids or yourself? You do get what you paid for, albeit it may cost you more than you think. I personally avoid food products originated from the PRC. I am willing to pay more to buy stuffs made in Japan, South Korea, Taiwan, and, of course, the US. Thanks for CC’ing your Nalencia picture. It’s a great illustration of a pirated product in China. IP Dragon is focused on gathering, commenting and sharing information on intellectual property in China. Thanks again. Great site by the way. Love the photo! I’m dying to go out & find my own ‘counterfeit’ oranges now.